Winter is the season for soups and stews. I could eat them every night. But when my son was growing up, he wouldn’t eat anything with multiple ingredients. That meant no soup, stew or casseroles. This soup was the only exception. Not only would he eat this potato cheese soup, he would ask for seconds and wipe the bowl completely clean with his bread. It has long been a favorite of every child who has every dined at our house. The recipe is very close to the original as published in The Silver Palate Cookbook. We usually served it with fresh French bread and a salad or fruit such as sliced apples. Melt butter in a soup pot. Add onions and carrots. Cook over low heat until vegetables are tender, about 25 minutes. Add parsley, broth and potatoes and bring to a full boil. Reduce heat, cover and simmer until potatoes are very tender, about 30 minutes. Add dill; remove soup from heat and let it stand covered, for 5 minutes. Pour soup through a strainer, saving broth. Transfer the solids to a food processor. Add some of the broth and process until smooth (in batches if necessary). 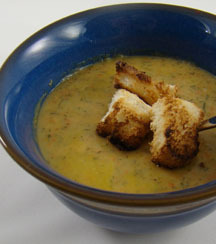 Return pureed soup to the pot and add some of the remaining broth until soup reaches desired consistency. Return to low heat and gradually stir in the grated cheese. When the cheese is melted and the soup is hot (not boiling), salt and pepper to taste. Serve immediately. I've been meaning to submit something to Kahakai Kitchen's Souper Sundays roundup since I first read about it, but this is the first time I've remembered. So check out her weekly blog event of soups, salads and sandwiches for some great recipes. If that was his exception, then I really need to give it a try! Neither of my kids enjoy soup, but we'll see how this one goes! Thanks for your congrats, Judy! Your comments always make me smile! Are your kidding? Potatoes and cheese? Who could resist this soup, sounds amazing, I can't wait to try it!